I’m trying to reduce the amount of sugar in my diet, which is SO hard because it seems like added sugar is EVERYWHERE. Do you have any tips to help me out? Flavored yogurt is often packed with added sugar… Yes, even vanilla! Try this Hungry Girl hack: Grab a container of fat-free plain Greek (or regular) yogurt, and flavor it yourself by pairing no-calorie natural sweetener (like stevia) with extracts and sweet spices. Vanilla extract and cinnamon is my go-to combination, but feel free to experiment: Try coconut extract with cinnamon or vanilla with pumpkin pie spice! Just use the extract sparingly… a little goes a long way! Bonus: There are some really good reduced-sugar flavored yogurts on shelves these days. 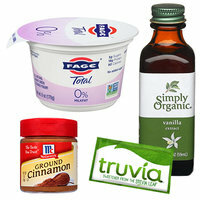 Check out Chobani Less Sugar, YQ by Yoplait, and Two Good Greek Lowfat Yogurt by Light & Fit. You can save a lot of sugar by swapping out traditional sugar for natural no-calorie sweeteners like Truvia. The packets are great for everyday uses (coffee, smoothies, yogurt, etc. ), and the spoonable kind is perfect in recipes. If you prefer 100% pure stevia, try the liquid kind. You can find that at most natural food stores and over on Amazon. There’s also a misconception out there that honey is low in sugar. While it does have some nutritional advantages, it still contains 17g of sugar per tablespoon. 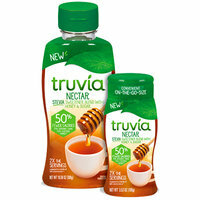 Truvia Nectar is an awesome way to get that honey taste and texture for fewer calories and less sugar. It’s twice as sweet as honey, so you only need half the amount! Dried fruit seems healthy -- it’s just fruit, right? -- but it often contains added sugar. And even the unsweetened kind has a lot of sugar, since it’s pretty dense and has a small serving size. 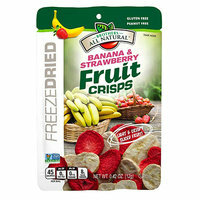 Fresh fruit is always a good call, but if you’re looking for more of a crunchy and snacky swap, freeze-dried fruit is a fantastic option. Unlike regular dried fruit, the portion size is big with a light texture, and there’s rarely added sugar. It’s sold at most supermarkets, so it’s easy to find. I love the Fruit Crisps by Brothers All Natural! Just a tablespoon of regular jelly has around 10g of sugar, but there are some amazing reduced-sugar options (without artificial sweeteners!) on shelves these days. 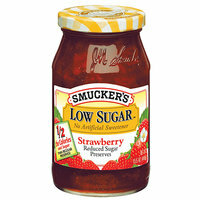 Smucker’s Low Sugar is a supermarket staple. If you want to save even more sugar, go for sugar-free preserves, like the kind by Polaner (which has added fiber). BTW, when it comes to PB&Js, you might want to flip your jar of PB around and make sure there’s no added sugar. Shocker alert: Marinara sauce often has sugar added to it! Who needs that? This lineup from Ragú is delicious and the only sugar in it comes from the tomatoes and other veggies. And here’s a little DIY hack: You can make healthy marinara and pizza sauce by seasoning up canned crushed tomatoes with things like Italian seasoning, garlic powder, and onion powder. I’m obsessed with this Swedish Fish swap-out… Only 3 grams of sugar per portion-controlled bag! The texture is spot-on, and there are none of those sugar alcohols that give some people stomach aches. And in case you missed it, check out this NO-SUGAR recipe for DIY Gummy Bears! These snacks are all-natural and much lower in sugar than your average granola snacks. Bonus: Each serving contains a full serving of hidden veggies! GAME CHANGER. These pints and bars are low in sugar AND high in protein. Light ice cream is still a better choice than regular, but Enlightened is eat-the-pint good, and SO low in calories! Happy National Frozen Yogurt Day, February 6th. It’s never too cold for fro-yo, so celebrate with a piece of this easy, freezy Red, White & Blueberry Fro-Yo Bark.